Barbara E. (Roche) Brady Plownoski – of Hillsborough, NH, formerly of Woburn, January 26th. Loving wife of David Plownoski of NH. Cherished mother of Robert Brady, his wife Renee of Reading, Michael Brady of Lowell and Laura Fennelly of Malden. Devoted grandmother of Ryan, Kaedan, Rylan and Donovan. Beloved friend of Julie Smith of Woburn. Relatives and friends are invited to pay their respects Friday, February 1st, from 4-8 p.m. at the Lynch-Cantillon Funeral Home, 263 Main Street, Woburn. Burial will take place at the convenience of the family. 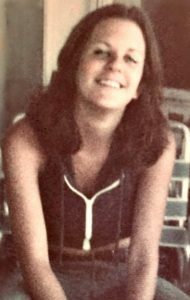 Barbara E. (Roche) Brady Plownoski – of Hillsborough, NH, formerly of Woburn, died peacefully after very brief battle with cancer, January 26th at Concord Hospital in Concord, NH. She was the Loving wife of David Plownoski. Born in Woburn, Barbara was a daughter of Richard and Florence (Korchak) Roche. She was educated in Woburn and a graduate of Woburn High School. Later in life she studied and obtained a certificate in substance abuse. Barbara was a a talented and creative person who enjoyed doing arts and crafts, especially with her grandchildren. Her family meant the world to her and she would do anything for them. Barbara is survived and will be deeply missed by her children, Robert Brady, his wife Renee of Reading, Michael Brady of Lowell and Laura Fennelly, her fiancé Brayden Murphy of Malden. Devoted grandmother of Ryan, Kaedan, Rylan and Donovan. Beloved friend of Julie Smith of Woburn. Dear sister of Richard M. Roche of VA and Joan M. Roche-Napolitano and her husband Al of Billerica. Relatives and friends are invited to pay their respects Friday, February 1st, from 4-8 p.m. at the Lynch-Cantillon Funeral Home, 263 Main Street, Woburn. Burial will take place at the convenience of the family. David: very sorry to hear of your wife’s passing. Offering my sincere condolences to you and Barbara’s family. Bobby,Michael,Laura, We were so sorry to hear of your Moms passing our sincere condolences to you all. Cousin Jim & Joanne Brady. Had lots of memories with you, Dickie and Barbara and your parents. Thoughts and prayers for you and your family at this very difficult time. Your mom was a great lady and loved you all so very much. Let your memories of her be the strength you’ll need to get through the pain. I’m thinking of you all this week. I am truly sorry for your loss, please accept my sincere condolences. I hope the Plonowski family find comfort and strength in Jesus promise along with our heavenly father Jehovah of the earthly resurrection found at John 5:28, 29, when death will be eliminated forever found at Revelations 21:4. Truly, what a glorious and almost unbelievable day that will be! It’s a reality though for God cannot lie! Barbara, this makes me so sad, we have shared many memories back in the early days, some good, some bad but we were always there for each other. I’m sure Michael is waiting with open arms for his Barb….I will watch over Laura, I promise you that, her and her three beautiful boys. Rest In Peace Barbara, I will never forget you.